Scientists have for the third time, detected gravitational waves, ripples in space and time, demonstrating that a new window in astronomy has been firmly opened. David Shoemaker, Spokesman for the LIGO Scientific Collaboration, said the waves were picked up by the Laser Interferometer Gravitational-wave Observatory (LIGO) on Jan. 4. The research result showed that they were generated when two black holes collided to form a larger black hole billions of light-years away from the earth, as was the case with the first two detections. Shoemaker noted in the research result that “we have further confirmation of the existence of stellar-mass black holes that are larger than 20 solar masses. 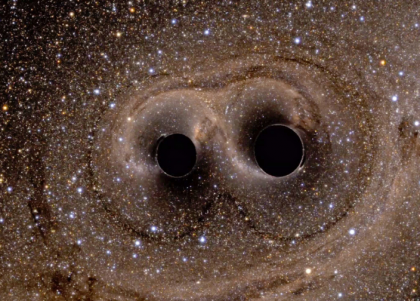 “These are objects we didn’t know existed before LIGO detected them. According to Laura Cadonati, the Deputy Spokesperson, it looks like Einstein was right even for this new event, which is about two times farther away than our first detection. Gravitational waves are ripples in the curvature of spacetime that propagate as waves at the speed of light, generated in certain gravitational interactions that propagate outward from their source. Gravitation waves were predicted by Albert Einstein over a century ago and were detected for the first time in September 2015. In general terms, gravitational waves are radiated by objects whose motion involves acceleration and its change, provided that the motion is not perfectly spherically symmetric (like an expanding or contracting sphere) or rotationally symmetric (like a spinning disk or sphere).